Madeline Smith was always a JEO strip favourite. She featured in many strips, and famously had a whole episode about her. Eventually, she complained. 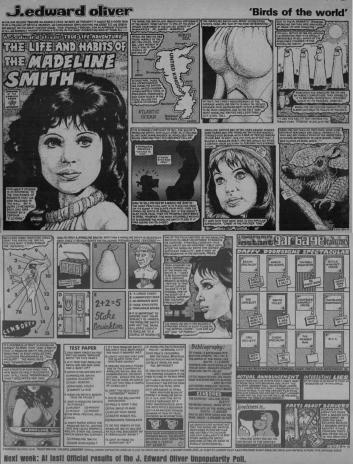 Jack: We sent her the original artwork of "The Life and Times of The Madeline Smith" in an attempt to prevent her considering suing us. That's when she phoned me: it turns out that she was aware of all my references to her, thanks to her cuttings agency. She said that she was really unhappy with her figure. Sometimes, she revealed, she stood in front of a mirror and howled. This came as a surprise to me, since it always seemed that her entire career was founded on her chest! I promised not to go on about her again, but asked if she would mind me referring in the strip to her phone call, to which she agreed. I kept my vow to avoid new material about Ms. Smith.